Ladbrokes Poker Promo Code: FTRBONUS for 200% Up To $2,000 for Free! Be sure to enter the Ladbrokes Poker promo code FTRBONUS during the account creation process when you sign up at Ladbrokes as shown in the screenshot above. After you do this, all bonuses and other promotions will be automatically applied to your account whenever you make a qualifying deposit. In some cases, you may have to opt in through the poker software to activate some promotions. If you deposit in dollars and receive the maximum bonus of $2,000, then you’ll need to earn 68,000 status points in order to receive all 400 $5 pieces of your bonus. In addition to the first deposit bonus, new players at Ladbrokes Poker receive four tokens to €2,000 New Depositor Freerolls and one entry into the weekly €1,250 Depositors Freeroll. As you generate rake and tournament fees, you’ll be earning Status Points. One dollar of rake will reward you with 10 points while €1 in rake is good for 14 points, and £1 in rake will grant you 16 points. Assuming you deposit $1,000 to receive the full $2,000 bonus, you’ll have to earn 68,000 points by generating rake equal to $6,800. Your bonus will clear in $10 intervals every time you earn 170 points. If you deposit or play games using another currency, then your mileage may vary, but should be similar to the numbers outlined here. This bonus offers a cashback rate of 29.41%. You can earn the needed points by playing 3,400 $20 + $2 Sit N’ Gos. If you’d prefer playing cash games, you can unlock the full $2,000 by playing approximately 206,061 hands of 50NL full-ring poker. Check out the sidebar on the right side of this page to get a general idea of how fast the bonus will be earned at different games and stakes. Between the ease of tracking your bonus information and the fact that you can earn your bonus in small pieces, almost every player – from beginner to pro – can greatly enhance his or her returns. Status points at Ladbrokes are very useful for clearing bonuses, but their utility doesn’t end there. Each status point will count towards your progress in the VIP Club. Start out as a lowly knight, and work your way towards becoming an emperor! As you level up the ranks, you’ll earn more and more Ladbrokes Points for each Status Point you accumulate. These Ladbrokes Points can be exchanged for cash bonuses, tournament tokens and pending bonuses. You’ll also be invited to special freerolls and, at the highest levels, a special VIP race awarding €5,000 every month! 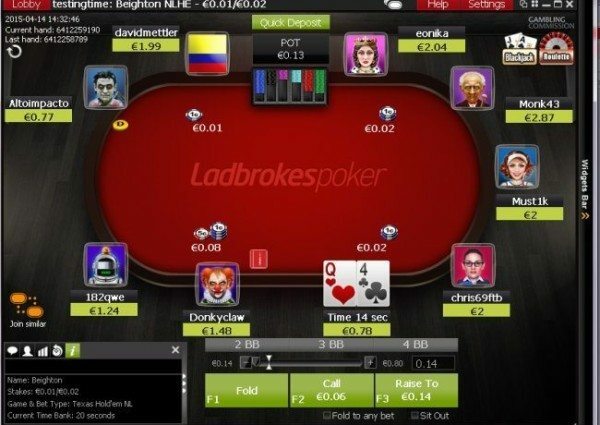 If you’re new to the world of poker, then Ladbrokes has got something that’s sure to pique your interest. 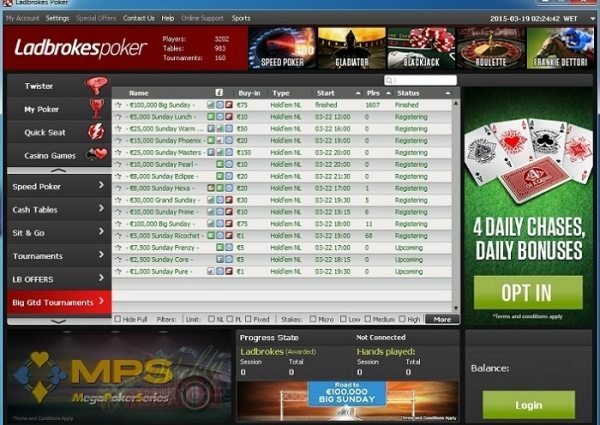 There are special beginners tables solely for players who have opened their accounts within the past 90 days. By opting in to the Beginners Race, you can compete for €500 in prizes every week based upon the number of status points you have achieved during the week at these beginners tables. As long as you can earn 50 points per week ($5 in rake), you stand a very good chance of placing in the leaderboard, which pays the top 50 players. 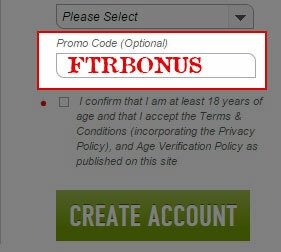 Remember to enter in the Ladbrokes Promo Code FTRBONUS when creating your account!